All individuals have a strong desire to be known and heard. As teachers, sometimes student collaboration can seem messy, especially when they disagree or challenge the ideas of their peers. Yet we know that effective student collaboration can foster a 21st century learning environment. This is an environment where new ideas and concepts are challenged, reinforced, and manipulated in ways that students can not accomplish alone. Research suggests that "...collaborative learning is most successful with loosely structure groups where learners work together towards open-ended goals." 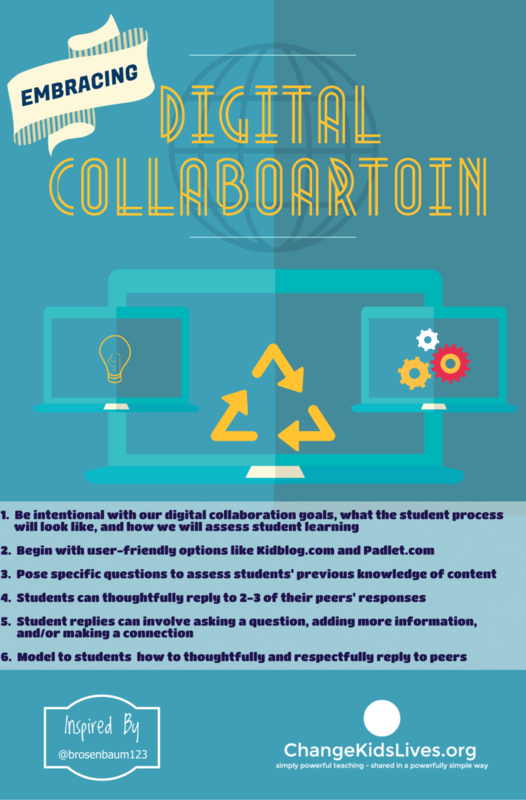 Collaborating digitally through websites and apps have presented new opportunities for students to have a voice in the dialogue that can continue outside the traditional classroom walls. Well before this technology existed, renowned theorist Lev Vygotksy (1962) noted the power of interaction and collaboration on children's development. Students' ownership and value of their words can be enhanced when they write on blogs that others can read. When students are allowed to connect to, question, and challenge each other's responses, they can dig deeper than any test question could ask. These opportunities allow them to shine their unique light and feel proud of their learning and growth. "As a teacher, I have the opportunity to change kids' lives so they can change the world." How are you using digital collaboration? Share a thought in the Comments section below.